After an initial conversation with Jon, we were sent a first draft of an itinerary, including hotel options. Reading that first draft showed us that Jon had listened to our interests and understood who we were and what would work for us. Throughout the planning process, they responded to our questions and ideas quickly and continued to evolve the itinerary factoring in our thoughts and feedback. We achieved a perfect balance of guided tours and time on our own. One person in our group has limited mobility and Jon made sure that all hotels, in addition to having elevators, were in great locations with easy access to great wanderings, attractions, restaurants and more. Our tours were led by friendly guides who knew their subjects, were great communicators and loved sharing their knowledge. Their guidance allowed us to experience local markets, major attractions like the Colosseum and the Uffizi and neighborhood streets in ways that would have been impossible either on our own or as part of a larger group. In Rome, our driver, Fabio, was waiting at the airport and was a wonderful intro to Italy. He was friendly, pointed out some sites, and talked with Merry (the Italian chef!) all the way in. Our hotel was great, in a perfect location right by the Pantheon, and the staff and service was wonderful. Our first tour in Rome was a culinary walking tour with Sarah as our guide and we had a wonderful time. After a cappuccino, we went to Mercato Coldiretti, her local market, for an informative and delicious tour of the beautiful and fresh foods and then had a picnic lunch there which was great. Sarah is American, married to an Italian, and talked about her learning about Italian ways & culture. We also went to the Jewish ghetto and had some really good sweets, then walked far enough to feel deserving of gelato and said goodby to Sarah. She was excellent-smart, knowledgeable, friendly and very attentive to what we wanted and needed! The tour of Ancient Rome, with our guide Caitlin, was really interesting and made me want to return to Rome and spend days just exploring the ancient sites. Caitlin was incredibly knowledgeable and clearly loved sharing her passion. We stopped at her neighborhood market to pick up fabulous sandwiches for our train trip to Venice! She even came into the train station with us and showed us where the info board was and got us situated, which was so kind and much appreciated. Both she and Sarah also shared personal experiences as non-Italians who had decided to live in Italy (from learning the language and customs to navigating the city), and this brought additional depth to our time with them. The train trip from Rome to Venice was great – we all enjoy train trips and this was a wonderful and comfortable one. We took a private water taxi directly to the hotel from the train station, which was a lot of fun and well worth the splurge. The hotel location was perfect for us, and Barbara and I took advantage of their onsite bar late one evening. We all enjoyed the rooftop terrace and brought back sandwiches one day and had lunch up there. Staff were very helpful and it was a great stay. Our walking tour of the city with Caterina was a lot of fun. We went into non-touristy neighborhoods and got some information about daily life which was great and just what we had asked for. Barbara and I had both been to Venice over 40 years ago and loved being back. Cheryl and Merry were just blown away by Venice. 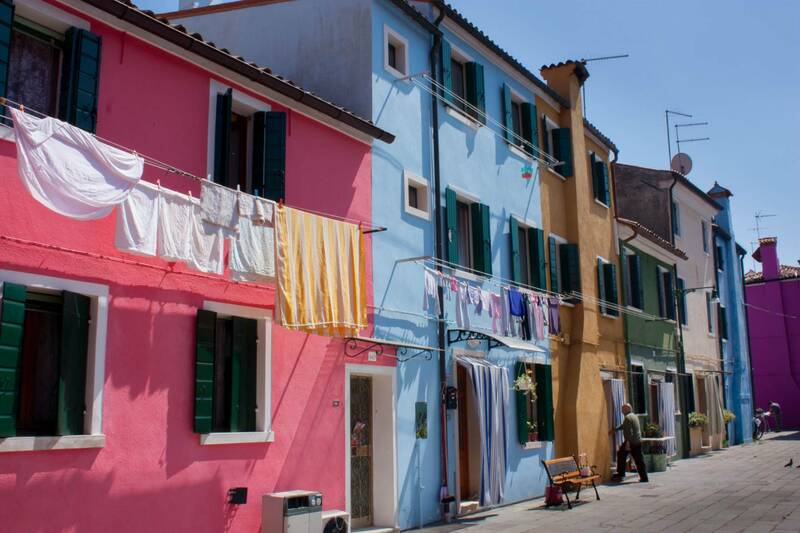 We spent one day going to both Murano and Burano, which was fun and beautiful. We had lunch at a little restaurant on the canal in Burano and had a great meal. Barbara shopped to her hearts content. We were sad to leave Venice, but Florence was wonderful. 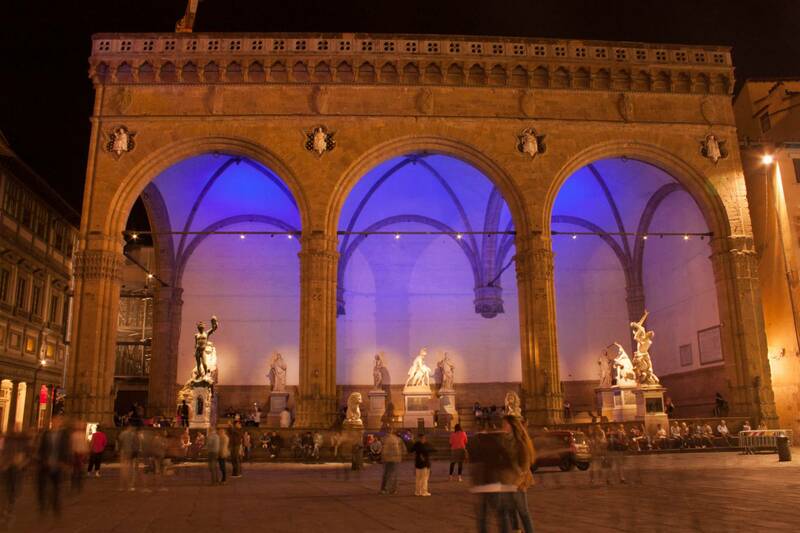 Our hotel, In Piazza della Signoria, was in another great location and it was also fun to be in a pensione type hotel. Again the staff were fabulous. During our tours, Barbara’s back was acting up which limited her walking and all three guides were very responsive to her need to walk a little then sit, walk then sit. On the twilight tour with Sashia, we had a great introduction to Florence, and the information she shared with us kept coming up throughout our time in Florence. On our culinary tour with Karin, she brought us to her local market, which was great fun. Cheryl and Merry loved all the culinary tours and we all really enjoyed Karin’s enthusiasm, knowledge & passion. She also stopped at a little food truck to give us the opportunity to try tripe – I think we surprised her when we all were willing to try it and liked it more or less! Our last tour in Florence focused on art history with Helen, another fabulous guide. She really made the art and history come alive. She used the Medici construct really well and we came away with a sense of the political passions, egos and intrigue through her stories about the statues, art and architecture. Oh and Barbara loved shopping in the open market! Thank you for setting up car rental pick-up from the airport rather than in downtown Florence! We still got lost getting out of the area but found ourselves eventually, thanks to our trusty GPS whom we nicknamed Gipi. Villa Marsili in Cortona was such a wonderful place to be based for our time in Tuscany and at the end of our trip! The staff were helpful and couldn’t have been nicer. The place itself was fabulous, with gorgeous old world charm, and we took advantage of all the sitting areas, the evening snacks and drinks and tea time! The view from our rooms over the town below was breathtaking. 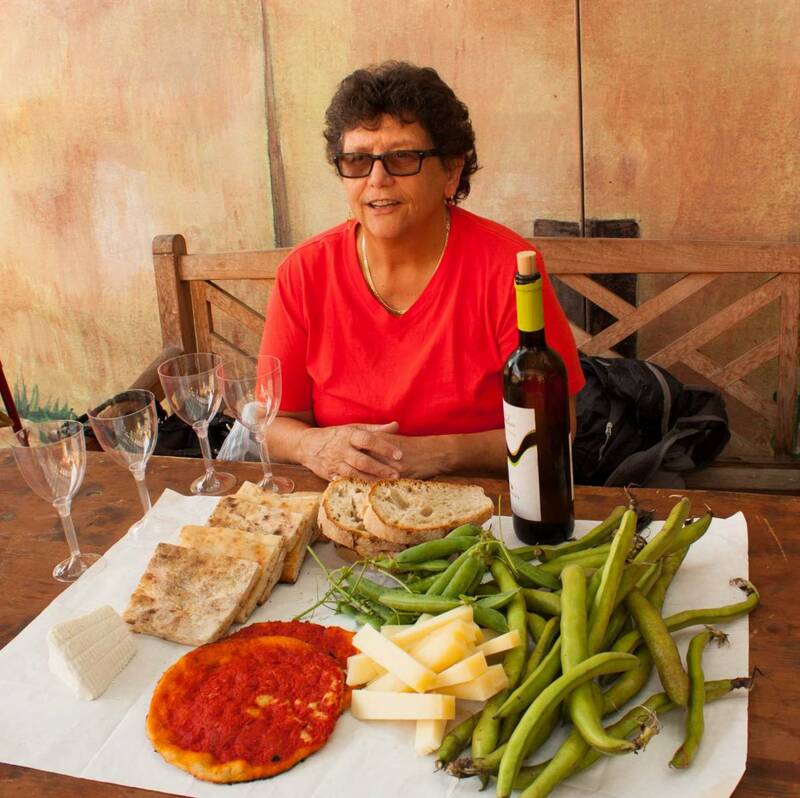 It was so nice to meet Ciao Andiamo’s co-owner and travel director Cristiana on this leg of the trip. 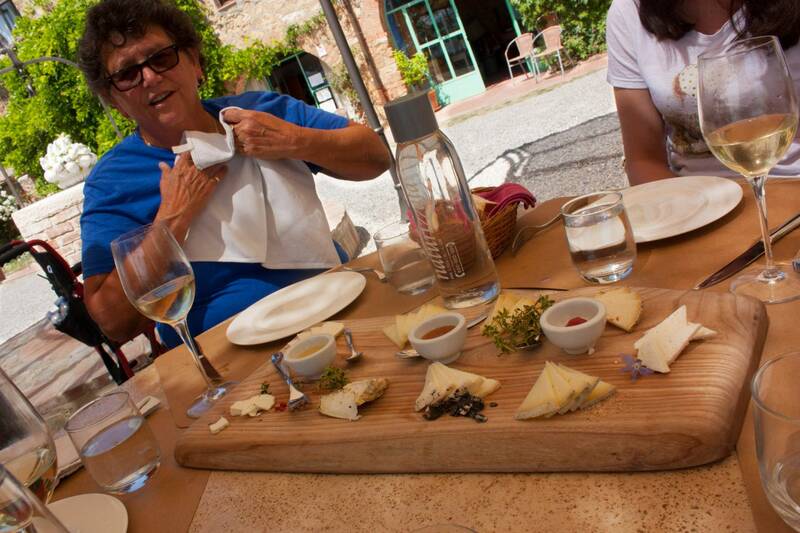 The organic farm tour with lunch, olive oil and wine tasting was absolutely great. Cheryl and Merry in particular were so impressed with the scope of the farm, the level of attention to detail in everything and we all loved how everything tasted! Our second day we didn’t have a guide but had a wonderful driver, Roberto. We started in Deruta and had a wonderful tour of the ceramic factory which was fascinating. Barbara and I bought a couple pieces and they arrived even more beautiful than we remembered. We enjoyed our brief time in Assisi before going on to Spello. The tasting in Spello was astonishing. Luca led us through the wines, olive oils, balsamic vinegar (7 and 25 year old!) and simple but fantastic food. We are now totally spoiled! We all bought olive oil to take home for use on special occasions. Throughout the trip, the days and times we had without a guide were also wonderful and helped make the trip feel leisurely and gave us a sense of really being immersed in the Italian culture, rather than rushed through from one sightseeing event to another. Thank you for making this such a special trip. We all had a fabulous time and Cheryl & Merry now have the traveling bug! We would plan another trip with Ciao Andiamo without hesitation.